After a long hiatus, I've managed to do a Head to Head Review! If you're new here, Head to Head Reviews are four-round matches that pit similar beers against each other in a boxing match to the finish. The commentator makes snarky quips and geographically appropriate cultural references while making no promises of impartiality. Tonight's battle is a match-up of two old-time competitors. Fighters come and go, but these two have been slugging it out for years. 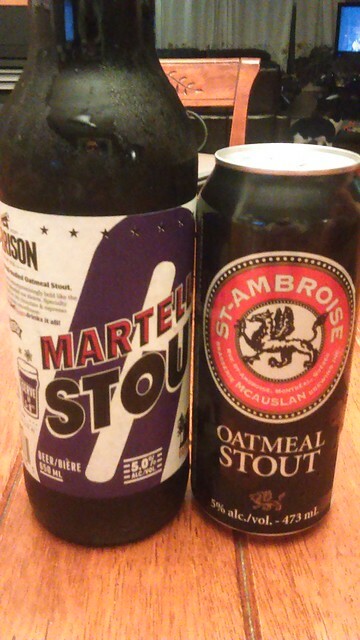 Ladies and gentlemen, tonight we have: Oatmeal stout versus oatmeal stout, Nova Scotia versus Quebec, it's Garrison Martello Stout versus St. Ambroise Oatmeal Stout! Garrison Martello Stout weighs in at 5.0% ABV and 30 IBU. Martello Stout has been brewed in Halifax by Garrison since around 2000. In the early years Martello was a bit of a lightweight, never really hitting hard enough to make an impact. It tried a few different styles but, just recently, has been spotted calling itself an oatmeal stout and ready to jump back in the ring to prove itself. St. Ambroise Oatmeal Stout weighs in at 5% ABV and 45 IBU. St. Ambroise has been brewed in Montreal since 1991! It has been proving itself since its debut and was once called the best beer in Canada by Stephen Beaumont. But, 2001 was a long time ago; memories are short and times have changed. Does St. Ambroise still have what it takes after 25 years, or will its supporters be disappointed like a Habs fan with a PK Subban tattoo? Can Martello make a comeback after years of false starts, or will it be out in the cold like a kilt-wearing busker at Spring Garden & Queen? Who will win this battle of the old-timers? As always, beers are chilled in the fridge, left to warm for a while and then poured into identical glasses. To your corners, and come out swinging. Martello starts strong with a nearly opaque black colour, matching St. Ambroise's colour blow for blow. Ambroise has a slightly darker head however, and Martello's begins to fade more quickly, like a tourist's sense of safety on Citadel Hill once the sun goes down. Round 1 goes to St. Ambroise. 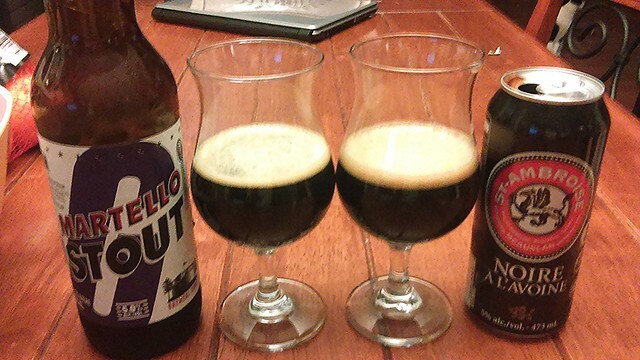 Martello surprises with a serious malty attack. Lots of roast upfront, with notes of cocoa and maybe even licorice. Like the success of Rita McNeil, the crowd is wondering how this could have happened. Ambroise counters with its own malty flurry: Roasty, with coffee notes and something more fruity and vinous. Martello is well-rounded, like Ellen Page in Juno, but comes up a little short, like Ellen Page in Juno. Round 2 goes to St. Ambroise. Ambroise is buoyed by round 2, so it immediately starts round 3 with a solid bitterness, like a Montreal cabdriver discussing the summer construction schedule. Martello hits back with its own solid bitterness, like a Halifax cabdriver discussing MacDonald bridge traffic. Bitterness won't decide this however, so Ambroise balances the bitterness with some oatmeal sweetness and roastiness. Martello sticks with the bitterness and adds more roast, but like poutine from Pizza Corner, it isn't quite good enough. Round 3 goes to St. Ambroise. Martello is reeling and is unable to put up much of a fight in the final round. Mouthfeel is light, with a drying finish that verges on being astringent. Ambroise has a fuller body which blends creaminess and a dry lingering finish. Martello throws in the tartan-patterned towel and St. Ambroise is declared the winner! As any Canadiens fan knows, even when nostalgia is the primary reason to enjoy something and you'd likely lose to a more serious competitor, you can still win a match every now and then. Congratulations to St. Ambroise Noire a l'Avoine! I was genuinely and positively surprised by Martello side by side with St. Ambroise. The aroma and appearance were actually good, but it really died in the finish. I think Garrison has been fooling with the recipe recently, because it was better than the last time I had it, and million times better than my first taste some 13 years ago. shorlin wrote: I was genuinely and positively surprised by Martello side by side with St. Ambroise. The aroma and appearance were actually good, but it really died in the finish. I think Garrison has been fooling with the recipe recently, because it was better than the last time I had it, and million times better than my first taste some 13 years ago. Interesting...I'll pick up a bottle and try it out. Good on ya! Great to see you back on the Head to Head, your fans have been missing you! Well, it might not be impartial, but it's accurate. The Martello is much improved, but still can't hold a candle to the St-Ambroise, which may in my humble opinion be the best stout in Canada. Might be moving. Want to buy my cellar? 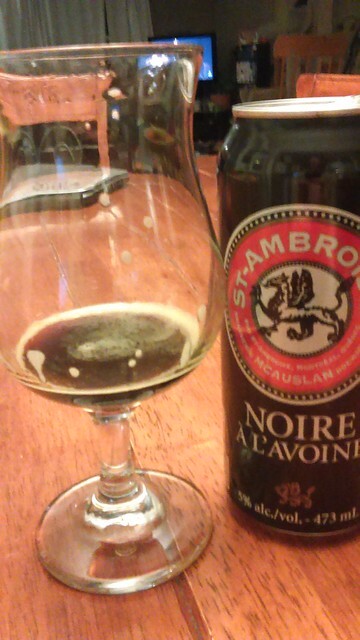 St-Ambroise is pretty much the only stout I've tried and liked. UXO wrote: Well, it might not be impartial, but it's accurate. The Martello is much improved, but still can't hold a candle to the St-Ambroise, which may in my humble opinion be the best stout in Canada. While hard pressed to be found on the eastern edges of Newfoundland, there is another Nova Scotian brew that I feel could take down the St. Ambroise Oatmeal Stout with a solid knock out punch. While I'm a huge fan of the St. Ambroise version, Big Spruce's Cereal Killer Oatmeal Stout is a serious contender in the style category... perhaps my favorite! I have to agree with Allan that Cereal Killer is very good, time for another head to head!